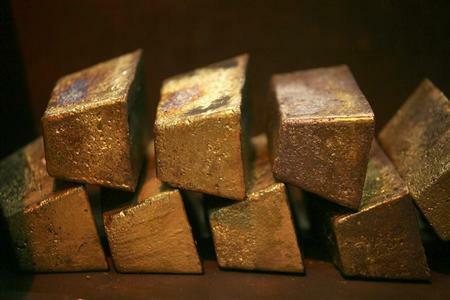 CAPE TOWN (Reuters) - South African gold producer Harmony Gold posted a loss in the second quarter of its financial year, hit by a lower bullion price and production problems at its key Khusalethu mine. The company said on Monday it also recorded a loss on foreign exchange adjustments due to rand weakness on dollar-denominated loans and gold inventories. Its headline loss per share for the quarter to December was 21 South African cents compared to a profit of five cents in the previous quarter. Harmony said it was positioned to benefit from a higher rand gold price as South Africa's currency trades near 5-year lows against the dollar. Gold is priced in dollars and Harmony gets over 90 percent of its production from South Africa. During the quarter its operating profit was hobbled by problems at its Khusalethu mine in South Africa, which has been the scene of labour violence rooted in a union turf war. But Chief executive Graham Briggs told journalists on a conference call that the problems at the mine had been technical and related to spillage and flooding "and they are behind us now ... It had nothing to do with labour."